Let us take 2 known climate records from history, the very cold winter of 1981-82, cold either in Europe or North America, and the very strange winter of 2013-14, cold in some places and warm in some others. On NOAA climate composite chart on top we can see jet stream largely Southwards compared to January 2014 being largely more jagged and more to the North. Continuous warm anomalies over the Arctic Ocean have been as incredible as the lack of sea ice compaction last summer. Both result from the same polar vortex wave arrangements, almost unrelenting like UK storms which flood the Isles and head towards the Pole. So I am truly not surprised about current low sea ice extent, it was suggested at the time of last minima by the very same cloudy cyclonic coverage which made the minima bigger. Again the big question is whether sea ice compaction will return come this summer, if it does, I can easily foresee a greater melt than 2012. That is the big if. Something must ward off these cyclones from hitting the High North so often, particularly the pack ice center. This something may be El-Nino or more likely a low sea ice extent area of relatively thick ice in the spring. Once the Polar shores are free of ice, a confluence of regularly positioned cyclones may return the Basin Gyre clockwise. One over Barents and North Pole, the regular expansive Baffin Bay Cyclone and lastly over East Siberian Sea. 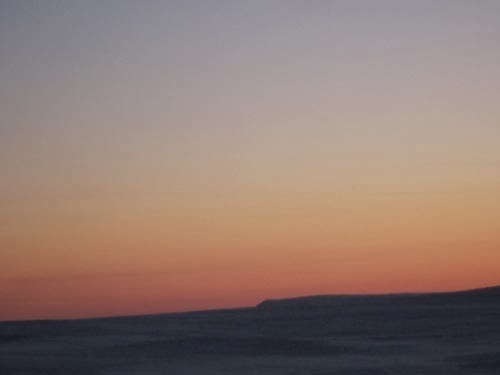 These 3 will generate an anticyclone covering the remaining Pack ice. Arctic Ocean shorelines with open water create anchors or stabilizes Cyclones to remain on top of water. A near persistent Low centering the Arctic Basin, same as last summer, may bring a cold spring . Ice clogged shoreline areas favor Highs instead of Low pressure cyclones fueled by water. An earlier than expected shoreline "spring break" of the entire Arctic Ocean sea ice area may change polar patterns though. Weather patterns rarely remain the same forever, when they appear to do so, they set up the new weather system arrangements to come. 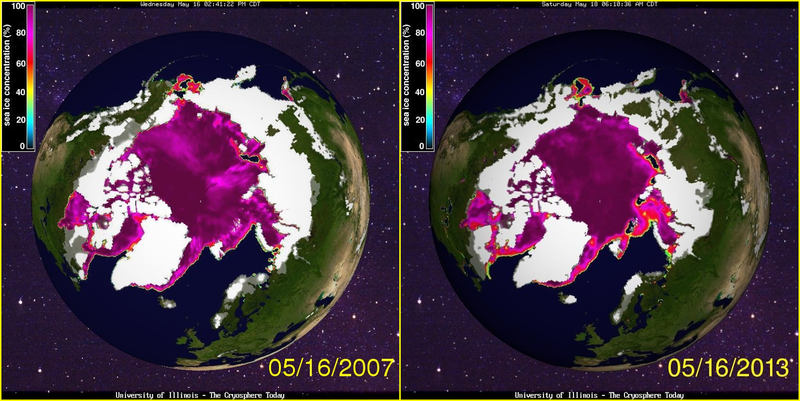 2007 sea ice looked better than 2013 on the same May date. But the end result at minima was different. Using available animation, when the big lead off the Canadian Archipelago coast spanned all the way to the Atlantic, the entire ice pack was seen rotating on May 14 2007. It was the beginning of one massive melt of even very thick ice. a wider over all extent of loose pack ice. 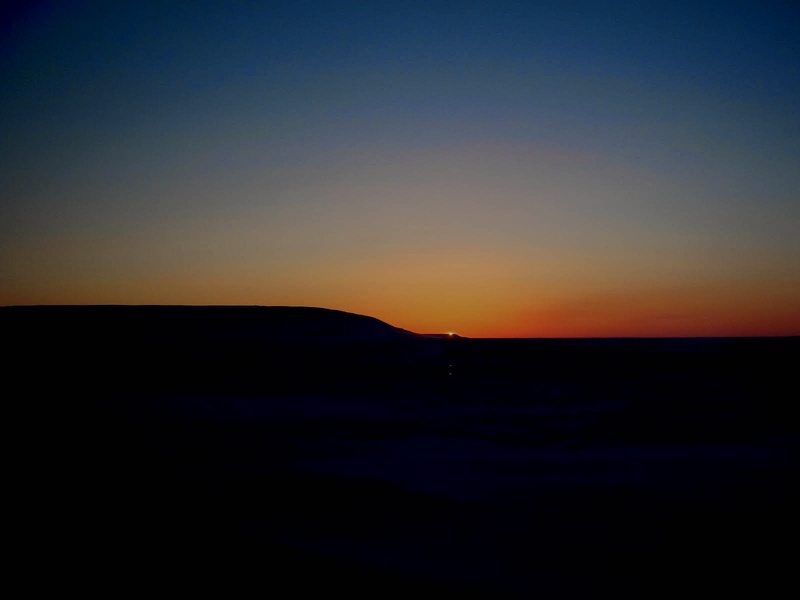 But by mid May 2013 there was no apparent "Spring Break" until August with available video from NASA. The entire Arctic Ocean ice didn't appear to turn clockwise at all, it was an anti-compaction melt season. 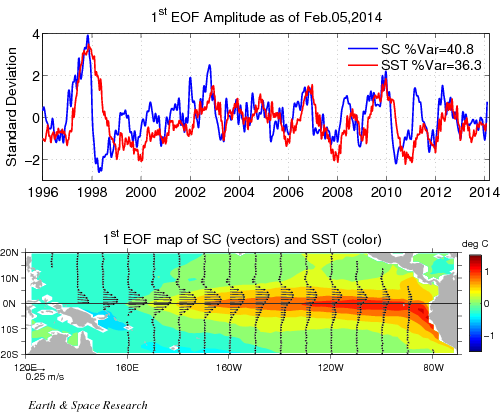 March 2010 El-Nino was already fading , High Arctic persistent stratospheric streaks reached 10 degrees above the horizon. zoomed October 2010 stratospheric black cloud streaks mixed with some bright ones, these coincided with the end of El-Nino of 2010, these streaks were as high as 5 degrees above the horizon. Presently 4 degrees was seen many times.